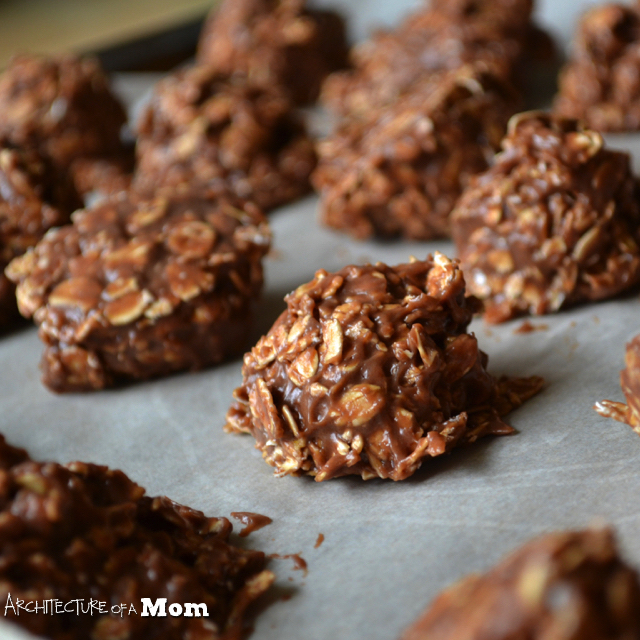 My husband loves chocolate oatmeal no-bake cookies. He makes them regularly. Perhaps too regularly. While we were off over the last couple of weeks, he made them twice. The kids certainly don't complain. But as a result, he tends to buy oatmeal at Costco--you know, so he won't run out! 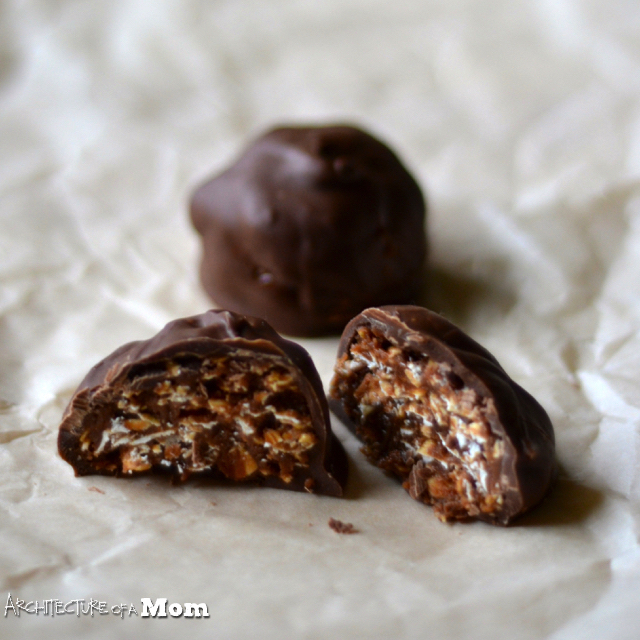 I like to dip into his stash to make granola, but I guess the Christmas spirit was upon me, too, because I couldn't resist making a bonbon version of Chocolate no-bakes. I was inspired by Cakes, Crust, and Sugar Dust to use sweetened condensed milk as my base--and I loved how easy it was! I may be making some more bonbons in the very near future. 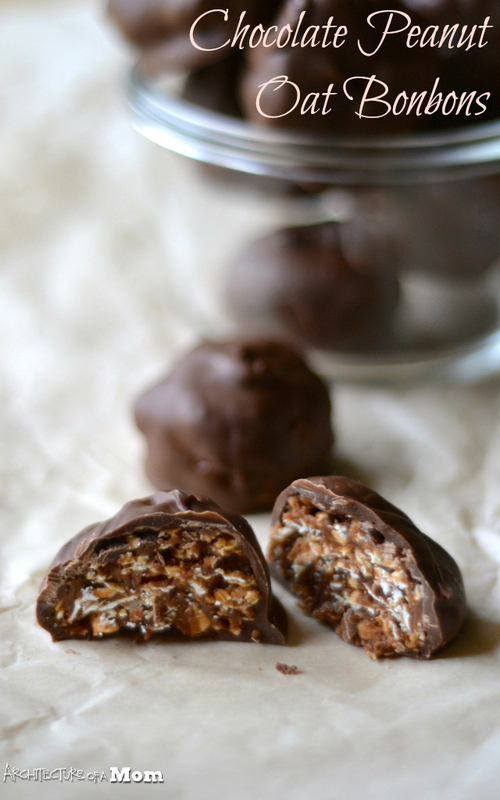 Like for Valentine's Day...since I know my hubby loves no-bakes, perhaps a tin of these Chocolate Peanut Butter Oat Bonbons will be in order! Whisk together the sweetened condensed milk and peanut butter. Add cocoa powder and mix until well combined. Fold in the oats. Mixture will be thick and sticky, but should be able to be rolled into a ball. Use a small scoop to make balls of the mixture that measure around 1" in diameter. Place on a cookie sheet that has parchment paper, wax paper, or a silicone mat on it and freeze overnight. Use a double boiler or a metal bowl over a saucepan filled partially with boiling water to melt the chocolate candy coating. Dip each ball into the candy coating until covered and place on some more parchment paper (or your preferred alternate) allow to cool. Keep refrigerated. Makes around 24.